Perry’s at the Beach Café has nine locations throughout Santa Monica and Venice, but I only really like one—and won’t bother going after 10 a.m.
My dad first introduced me to the morning charm of Perry’s one Sunday a few years back. Since then, he makes time once every weekend to drive over and say hi to the ocean. It runs in our blood: visiting the beach, even if just for a few moments, is a cleanse for our brains. After spending the past year land-locked and studying in Arizona, I found myself more anxious to visit the ocean this summer than ever before. The Perry’s that my dad and I patronize is a few miles past the Santa Monica Pier heading toward Venice. Sometimes I look around and wonder how a place could be so charming. A few times a week, as I made my summer commute from the San Gabriel Valley to an office in Santa Monica, I left an hour earlier than I needed to—all so I could park my car in a $1 per hour lot, leave my shoes in the car, and go to Perry’s. Each visit begins the same way: I walk up to the counter and am greeted with a big smile by perhaps the cheeriest guy in this city. He’s patient with me as I stare at the board for minutes, contemplating their extensive menu. Is it weird to have mahimahi tacos for breakfast? I wonder. Deciding against it, I end up choosing the King Richard’s veggie breakfast burrito with egg whites. I settle into one of the red lawn chairs they’ve set up in the sand as I watch the ocean waves and wait for them to call my number. I’m often the first number of the day. They open at 9 a.m. on weekdays, and that’s exactly when I like to show up. On a Tuesday morning, there are rarely many people at this walk-up, shoe-optional beach café, and that’s a big reason I’m there. Beachfront peacefulness is hard to come by in a crowded city. Santa Monica is full of people and traffic, but it still feels like a real beach community before the day begins. There aren’t even that many cyclists out at that time—just a few joggers and weary surfers. It’s well worth waking up early to catch a moment of small-town charm. 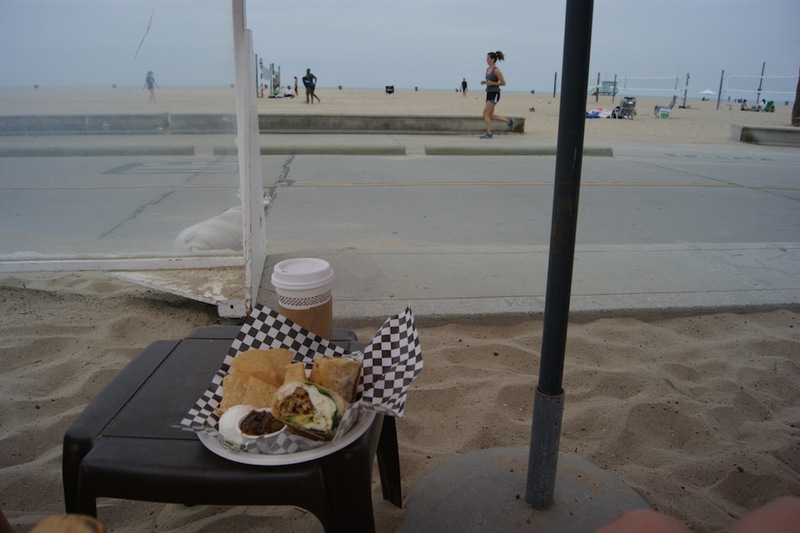 Nothing I’ve found in L.A. beats the combination of crisp morning air, toes in the sand, and a small black coffee as I wait for my breakfast. It’s always a good morning after that. Kelsey Hess is a sophomore at Arizona State University’s Cronkite School and was a sustainability journalism fellow at Zócalo Public Square.